A couple of years back, we picked up a 35’ modified Charybdis MkII steel ketch, designed by Robert Tucker, home built by a blacksmith, and launched in 1978. 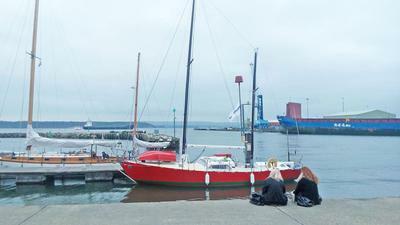 At the time, we were imagining we would be doing a fair bit of offshore sailing, and this is the perfect boat for that; in terms of construction, it’s a real go anywhere boat. The boat had been moored in Poole for the previous thirty eight years. 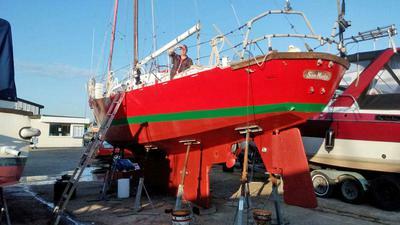 We bought her, had her hauled, surveyed, repainted and re-rigged. We took her over to Carentan in France, where she is now moored. Our problem is that since we bought her, our circumstances have changed, and we don’t think we’re going to be doing the offshore thing. We’re not sure we’re physically up to offshore cruising anymore. We’re thinking canals may be more our speed! The engine is a Lister SR4, four cylinder diesel, 30 horse - Clydesdales, not show ponies. It's one of the most reliable engines made. It is air cooled so you have no underwater fittings, no heat exchangers to clog up, or cylinder head warping or overheating. It is in excellent condition. As long as the fuel is not frozen or waxy Listers will start in all conditions. There's two 30 gallon (135L) steel fuel tanks. The gearbox is hydraulic in neutral and reverse gear but manual in forward gear, so if there was ever a problem, you can start the engine in gear to get you home. At the end of the gearbox is a 2:1 reduction gear which drives a 1 3/4” stainless steel shaft which is in turn in a stainless steel tube. It is of commercial fishing boat standards. She swings a 2 bladed, 19.5” propeller. There are lots of spare engine parts. Structurally, the bottom of the keel is 3/4" thick, the keel is 6mm, hull is 4mm, chines are 5mm, decks are 1/8" plate, cabin sides are 4mm. She is framed every 18 inches with 1 1/2" x 1/4" bar. All surfaces are curved on the hull and she has 1" by 1" square profile thick wall tubing every 18” on the deck. The original Charybdis Mk II design had a 4 ft draught, but that was modified on this boat and extended to 5' 6”. The keel is a long fin, with skeg hung rudder, and she tracks and manoeuvres superbly. For sails, there's a cruising chute with snuffer, 180% tri-radial on a Harken furler, a hanked-on genoa on the forestay, a heavy weather foresail with hanks, a storm jib and other jibs, plus a spare set of main and mizzen sails. 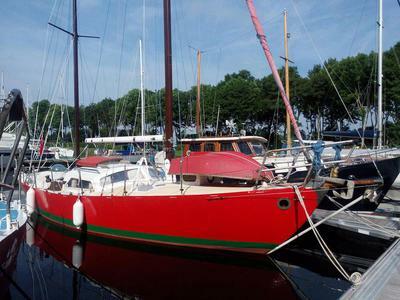 All the sails are in great condition, except for the main and the furling genoa which are in good condition. Most are from Quay Sails of Poole. The foresail sheets lead to a pair of Gibbs two speed self tailing winches in the cockpit. All chain cable with Bruce and Danforth anchor, Moyle single action/anchor windlass. There's also an Aries lift-up wind vane which we'll be selling separately, if you're interested. 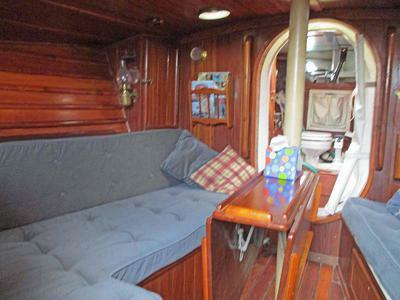 Belowdecks, there is an aft cabin, not connected to the main cabin, a galley and saloon in the main cabin, and the forepeak area houses (boats?) the heads, heater, and sail and hanging locker areas. The forepeak heater's a Refleks diesel drip feed with hotplate, and the galley boasts a lovely brass Taylors kerosene oven. There's an Eberspacher diesel heater for the main cabin, but we haven't tried it. The interior is fitted out with Burmese teak and Australian jarrah woods - not the flimsy stuff you get these days, but heavy solid planking. As previously mentioned, the plumbing and electrical systems are rudimentary, as is the nav system (charts) and olde style depthfinder. There are some quite nice brass kerosene lamps for illumination. Most of the standing rigging was replaced in 2016. There's a fairly recent survey for the boat, which we'll make available to those seriously interested. It's structurally very sound, but, as we said, could use some plumbing and electrical upgrading, as well as a sandblast and paint job. If you're interested, let's talk!